Madura was born on March 4, 1886 in the village of Pecagakan Jepara. He is the eldest son of Mangunkusumo, a lowly gentleman in the Java community structure. Mangunkusumo career began as a Malay teacher at an elementary school in Ambarawa, then a principal at an elementary school in Hyderabad and later became administrative aide at the Semarang City Council. Meanwhile, the mother was a descendant of the landlord in Mayong, Jepara. Although his family does not include high-class gentleman bureaucratic social position, Mangunkusumo managed to send their children to a higher level. Cipto along with her sisters, namely Gunawan, Budiardjo, and Syamsul Ma'arif school in Stovia, while Darmawan, siblings and even managed to obtain a scholarship of the government the Netherlands to study industrial chemistry at the University of Delft, Netherlands. The youngest, enrolled Sujitno Law School in Jakarta. While studying in Stovia, Cipto began to show a different attitude from his friends. Friends and teachers assess Cipto as personally honest, sharp-minded and diligent. "Een begaald leerling", or gifted students is the nickname given by his teacher to Cipto. In Stovia Cipto also experienced a split between him and the school environment. Unlike his friends who like to party and play snooker, Cipto prefer to attend lectures, read books and play chess. His appearance at a special event, quite eccentric, he always wore surjan with striated material and smoking incense. Dissatisfaction with the surrounding environment, the topic of his speech senantiasan. For him, Stovia is the place to find themselves, in terms of freedom of thought, apart from a strong family tradition, and become acquainted with the new environment discriminatory. Several Regulations on Stovia causing dissatisfaction in destiny, as all students of Java and Sumatra, non-Christians were required to wear clothing tadisional when they are in school. For Cipto, regulation Stovia dressed in colonial politics embodies the arrogance and preserve feudalism. Western dress may only be used in the administration of the colonial hierarchy, ie the native ranking regent. Indigenous people of the district officer down and that did not work in the government, banned wearing Western clothes. The implications of these habits, people tend to not appreciate and respect the indigenous people who wore traditional dress. This situation is always described by De Locomotief, colonial press very progressive at the time, in addition to Bataviaasch Nieuwsblad. Since the year 1907 Cipto already wrote in the daily De Locomotief. His writing contains criticism, and against the state conditions are considered unhealthy. Cipto often criticized feudal and colonial ties are considered as a source of human suffering. In the feudal system lameness lameness occurs in the community. People generally limited space and activity, because a lot of opportunities closed to them. Keturunanlah that determines one's fate, not skill or ability. A child is "normal" will remain backward district of the child or other notables. Other colonial conditions Cipto is opposed by racial discrimination. For example, Europeans receive a higher salary than the natives for the same jobs. Discrimination a difference in a variety of fields, for example, the judiciary, the difference in tax liabilities forced labor and rural labor. In the area of ​​governance, political, economic and social, Indonesia faces the color boundaries. Not all positions are open to the country of Indonesia. Similarly, in trade, Indonesia did not have the opportunity to trade on a large scale, not any Indonesian children can attend the European school, no one dared to enter Indonesia and sociteit ball room. All the measured color. His writings in the daily De Locomotief, resulting Cipto frequently reprimanded and warnings from the government. To preserve freedom in Cipto later found out from the local government and the consequences of his official bond refund a sum of money not less. In addition to writing, Cipto also frequently protested by acting against the flow. For example, entering sociteit ban for Indonesia not diindahkannya. With the typical clothing batik and striated coat, he went into a full sociteit the Europeans. Cipto then sit with your legs stretched out, it invites uproar in sociteit. When a OPAS (guard) tried to evict Cipto to get out of the building, with the vocal Cipto cursing the OPAS and the people near him to use the Dutch language. Cipto authority and the use of the Dutch language fluently make the Europeans stunned. The formation of Budi Utomo on May 20, 1908 Cipto welcomed as a form of indigenous consciousness of himself. At the first congress in Yogyakarta Budi Utomo, identity politics Cipto increasingly apparent. Although the congress was held to promote the harmonious development for Java, but in fact the cracks between the conservatives and the progressive faction represented by the young. This is very ironic rift started a ideology that splits open to the Javanese. In the first congressional discord between Cipto and Radjiman. Cipto want Budi Utomo as a political organization to be engaged in a democratic and open to all the people of Indonesia. This organization must be a leader for the people and not to seek relationships with superiors, regents and other high officials. Meanwhile, Budi Utomo Radjiman want to make as a cultural movement that is Java. Cipto not resist Javanese culture, but that he rejects is a feudalistic culture palace. Cipto suggested that before the matter can be dipecahan culture, political issues resolved first. Statements Cipto considered radical for its time. Cipto ideas showed high rationality and sharp analysis to reach the future, has not received wide response. To pave the way for the emergence of unity among all the people in the Dutch East Indies who have the same fate under foreign rule, he can not be achieved by encouraging the rise of Javanese life. Occupation of the people is the source of backwardness and feudalism. Although appointed as caretaker Budi Utomo, Cipto finally resigned from Budi Utomo deemed not represent their aspirations. After the death Cipto no longer debate the Utomo Budi Budi Utomo but the loss of power progesifnya. After resigning from Budi Utomo, Cipto opens physician practices in Solo. Nevertheless, Cipto not leave politics altogether. On the sidelines kesibukkannya serve patients, Maya Raden Kartini Cipto established club that aims to improve the lot of the people. Political attention intensified after he met with Douwes Dekker to set up a center to propagate Partij Indies. Cipto see Douwes Dekker as a comrade-in-arms. Cooperation with Douwes Dekker has given him a chance to implement his ideals, the political movement for all people of the Dutch East Indies. For Cipto Indische Partij a noble effort to represent the interests of all residents kepentngan Dutch East Indies, irrespective of race, class, and religion. In 1912 Cipto moved from Solo to Bandung, on the pretext that close to Douwes Dekker. He later became the editor of the daily de Expres publishing and magazine Tijdschrijft het. Introduction between Cipto and Douwes Dekker minded had actually been forged when Douwes Dekker worked on Bataviaasch Nieuwsblad. Douwes Dekker frequent contact with students Stovia. In November 1913, the Dutch commemorate 100 years of independence from France. The warning was celebrated on a large scale, as well as in the East Indies. Celebrations are under Cipto as an insult to the people of the earth who are colonized son. Suwardi Suryaningrat Cipto and then set up a committee of Dutch independence centennial celebrations with its behalf Earth Son. In committee Cipto believed to be its chairman. The Committee plans to raise money to send a telegram to the Queen Wihelmina, requesting that restrictions on political activity and the chapters form a parliament repealed. Bumi Putra Committee also made leaflets aimed people realize that the ceremony Dutch independence by mobilizing the people of money and power is an insult to the sons of the earth. Action Committee on Earth Son peaked at July 19, 1913, when the daily De Express published an article entitled Suwardi Suryaningrat "Als Ik Nederlands Was" (I Had A Netherlands). The next day in the newspaper De Express Cipto Suwardi write articles that support for a boycott of Dutch independence celebrations. Posts Cipto very hit and Suwardi Dutch government, on July 30, 1913 Cipto and Suwardi imprisoned, on August 18, 1913 decision to throw out the letter with Suwardi Suryaningrat Cipto and Douwes Dekker to the Netherlands because the Dutch anti propaganda activities in the Earth Committee Son. While in exile in the Netherlands, with Suwardi and Douwes Dekker, Cipto still waging political action by political propaganda by ideology Indische Partij. They publish the magazine De Indier that seeks to make people aware Netherlands and Indonesia in The Netherlands, the situation in the colonies. De Indier magazine published an article attacking the Dutch East Indies government policy. The presence of the three leaders in the Netherlands turned out to have a significant influence on the organization of Indonesian students in the Netherlands. Indische Vereeniging, in the beginning was the social gathering of Indonesian students, as a place to keep each other informed about his homeland. However, the arrival of Cipto, Suwardi and Douwes Dekker impact on new concepts in the movement of this organization. The concept of "freedom from the Dutch East Indies and the establishment of an Indian state which was ruled by its own people started proclaimed Indische Vereeniging. Their influence is increasingly felt by the publication of the journal Indische Vereeniging Poetra Indies in 1916. Because of health reasons, in 1914 Cipto allowed to go back to Java and since then he joined Insulinde, an association that replaces Indische Partij. Since then, a member of the central committee Cipto Insulinde for some time and launched a propaganda for Insulinde, especially in coastal areas north of the island of Java. Moreover, for the sake of propaganda Cipto Insulinde also run through the magazine Indsulinde Goentoer Move, then the Dutch-language newspaper De Beweging, Madjapahit newspapers, and newspapers Heroes. As a result of propaganda Cipto, Insulinde number of members in 1915 were originally numbered 1009 increased to 6,000 by 1917. The number of members Insulinde peaked in October 1919 that reached 40,000 people. Insulinde under the strong influence Cipto a radical party in the Dutch East Indies. On June 9, 1919 Insulinde renamed Nationaal-Indische Partij (NIP). In 1918 the Dutch government established the Volksraad (People's Council). Appointment of members of the Volksraad done in two ways. First, candidates are selected through city councils, districts and provinces. While the second way through appointment by the Government of the Dutch East Indies. Governor-general Van Limburg Stirum raised some radical leaders with the intention that the Volksraad can accommodate a variety of flow that can be highlighted democratic nature. One of the radical leaders appointed by the Limburg Stirum is Cipto. For Cipto Volksraad formation is a significant advancement, utilizing Cipto Volksraad as a place to express thoughts and criticisms to the government on social and political issues. Although Volksraad considered Cipto as an advance in the political system, but still expressed his criticism Cipto Volksraad he regards as the agency to maintain colonial rule under the guise of democracy. On November 25, 1919 Cipto speech in the Volksraad, which it raised the question of conspiracy Sunan and resident in deceiving the people. Cipto stating that the loan of sunan turns 12 guilders paid people to work in such a long time that if the plantation converted the money turned out to be 28 guilders. Seeing the fact that Dutch government considers Cipto as being very dangerous, so the Council of the Indies (Raad van Netherlands Indies) on October 15, 1920 to advise the Governor General to expel Cipto to the area who do not speak Java. However, in reality disposal Cipto to Java, Madura, Aceh, Palembang, Jambi, and East Kalimantan government still dangerous. Therefore, the Council by a letter to the Governor-General to propose the expulsion Cipto to the islands of Timor. In the same year Cipto removed from the area but still in the Java language Java, which is forbidden to leave the city of Bandung and Bandung. During his stay in London, Cipto back the doctor's office. During the three years of medical sciences devoted Cipto in Bandung, he went out on his bike villages to treat patients. In Bandung, Cipto can meet younger nationalists such as Sukarno in 1923 to form the General Study Club. In 1927 the General Study Club was changed to the Indonesian National Party (PNI). Although not an official member Cipto in the General Study Club and PNI, Cipto still recognized as a major rationale for the younger generation. For example, Sukarno in a press interview in 1959, when asked who among the leading personalities Indonesia where most impact on his political thinking, without hesitation Sukarno called Madura. At the end of 1926 and 1927 in several places in the Indonesian Communist uprising. The insurgency and the failure to meet the thousands of people arrested or discharged for engaging in it. In this case Cipto also arrested and charged with taking part in the resistance against the government. It was due to an event, when in July 1927 a visitor Cipto a native army at the rank of corporal and his friends. To Cipto guests said it plans to carry out sabotage by blowing up ammunition supplies, but he intends to visit his family in Jatinegara, Jakarta, first. For that he needs money for travel expenses. Cipto advised that the person does not commit an act of sabotage, Cipto compassionate grounds then gave the money to his guest for 10 guilders. After the communist rebellion failed and dismantled the case of blasting powder magazine in London, Cipto summoned to appear before the court because the government is deemed to have contributed in helping the communists by giving money 10 guilders and the discovery of the names of the heads of the rebellion on the guest list Cipto. As punishment Cipto then exiled to Banda in 1928. In captivity, disease asthma relapse. Some comrades Cipto then proposed to the government to Cipto released. When Cipto asked to sign an agreement that he can return to Java by releasing political rights, Cipto expressly says that it is better to die in Banda rather than relinquish their political rights. Cipto then transferred to Napier, and in 1940 moved to Sukabumi Cipto. Cipto stubbornness brought to politics until his death on March 8, 1943. Balfas. , 1952. Dr. Tjipto Mangoenkoesoemo: True Democrats. Jakarta: Pradjaparamita. Kartodirdjo, Sartono. 1990. Introduction to the History of New Indonesia. National Movement History of Colonialism to Nationalism. New York: Scholastic. Nagazumi, Akira. 1989. The rise of Indonesian nationalism: Budi Utomo 1908-1918. Jakarta: Grafitipers. 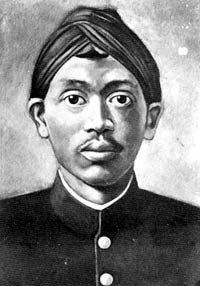 Notosutanto Nugroho.Et al. 1977. National History of Indonesia. Volume V. New York: Library hall. Mulyono, Slamet. 1968. Nationalism As the capital of Indonesian Struggle. Volume I. Jakarta: Central Library.